The NRCL is proud to be supporting the Charlton community to assist in plans to re-establish and restore the Charlton Community Forest. Originally planted in 1947 by the local community with the assistance of the Save the Forests Campaign (a forerunner of the Natural Resources Conservation League of Victoria), the Forest, located on Crown Land 2km west of Charlton, requires a great deal of work to restore it. The planting day in 1947 involved 600 residents and was captured on film by the Save the Forests Campaign. The film with images of the Charlton Township was recently played at the Charlton 150th Back-to at Easter 2013 which renewed interest in the community forest. 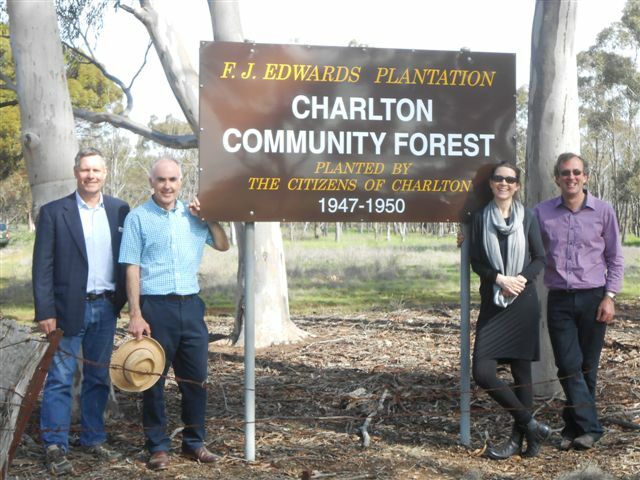 The NRCL is supporting the Charlton Community Forest project by providing funds to officially launch the project, replace the original plantation sign and contribute funds towards a flora and fauna survey of the area. 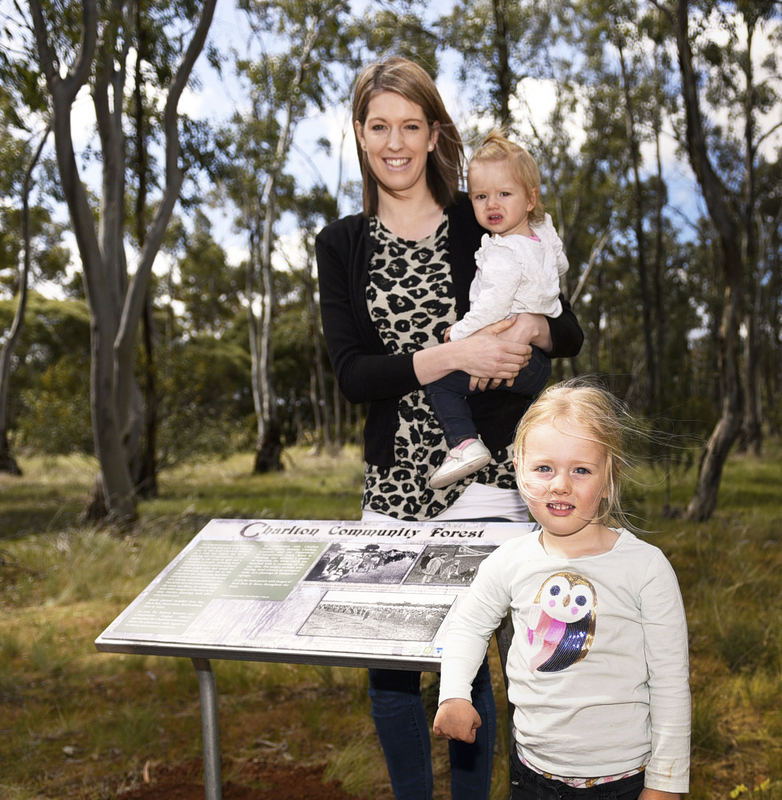 The main aim of this project is to rejuvenate the area into a more natural bush setting with a picnic area and interpretive panels providing information on local flora and fauna. The project commenced with a big day of activities on Sunday September 8 2013 in Charlton. In the morning, the 1947 film, Let’s Plant a Tree, was shown in the beautifully restored art deco Rex Theatre in Charlton. The theatre which is run by the local community suffered badly in the recent floods that affected Charlton. It has now been restored to its former glory. NRCL Director, Sarah Barker welcomed over fifty residents of the area and outlined the aim of the project. It was a real treat for a number of residents who were featured in the film (as schoolchildren) to re-live their memories of the planting day when the whole town shut down to participate in the event. Many shared their memories of the day when the forest was planted. The focus of the day then shift to the Community Forest where a restored sign based on the original design was unveiled by Elaine Storey who was part of the original planting. NRCL Director, Sarah Barker presented a cheque to the Charlton Landcare Group to launch the project. Local Landcare representatives, Marion Watts and Geoff Winsall accepted the cheque on behalf of the local community. A number of the original participants in the 1947 planting were joined by local residents and representatives from the NRCL for a BBQ lunch followed by a guided tour of the site by Jason Cashin who not only produced the new sign for the site (his day job!) but also used his birdwatching skills to spot a number of local birds. 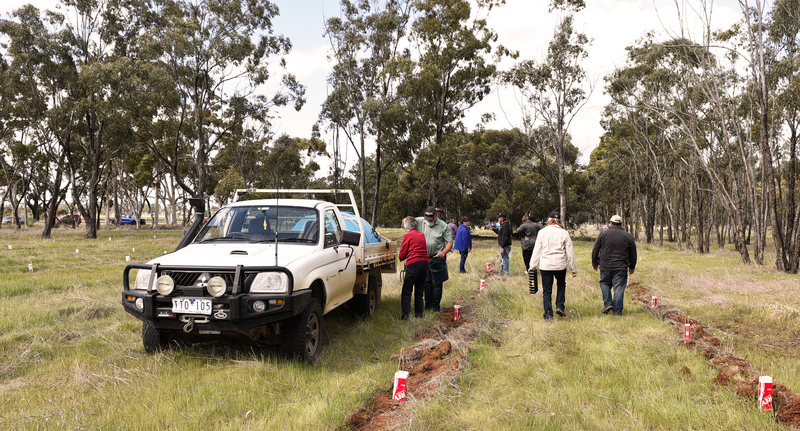 This project had wide support from the Buloke Shire, Charlton Forum and the newly formed Charlton Tourism who saw it as an opportunity to build on Charlton’s natural attributes. The plantation also forms part of a larger plan to develop the area, connecting the original community forest to other nearby areas of indigenous vegetation. A celebration was held on September 24 2017 at the forest to unveil the new signage and undertake some plantings. Kelly Wright – proprietor of Signwise solutions, the local business who created the signs – with her two children had the honour of unveiling the 1st sign.